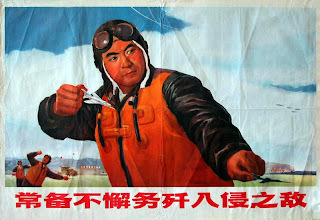 All hail the glorious artworks of the Cultural Revolution! No to the running dog lackeys of imperialism! Yes to solidarity with the workers, peasants and soldiers! Down with the revanchist critics! Resolutely oppose abstractionism! Down with bourgeoise modernism! All out to support the opening on Friday of the exhibition of Maoist propaganda posters at the Art Gallery of Victoria! You don’t have to be proletarian to appreciate “Communist Paradise,” a show based on the collections of a gallery curator and a professor. The posters depict prosperity for peasants and achievement for workers, all under the beneficent protection of soldiers. “It’s an image of an ideal world,” said Richard King, an associate professor at the University of Victoria. “It’s an image of a world that never quite was, but that was supposed to be. An image of a world of abundance, of unity, of loyalty, of achievement. The reality, needless to say, was harsher. Instead of reflecting the “terrible, terrible tales of Red Guard violence,” the images show wholesome youth reading the works of Chairman Mao beneath fluttering red flags. Prof. King studied in China for two years at the end of the tumultuous Cultural Revolution, a violent and unpredictable time. The posters were designed to be posted in public places for a population including many illiterates. They were manufactured in vast quantities on inexpensive paper. 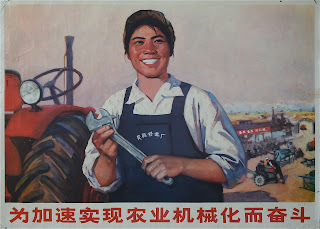 Few kept such political posters in their homes, where one might instead find an image of Mao. The political posters were ephemeral, so some today are rare despite having been produced in mass quantities. On eBay, posters in mint condition extolling the glories of Chinese socialism command bids that test the purse of a plutocrat. Born in Willaston, a village in northwest England where his father worked as a large-animal veterinarian for the University of Liverpool, he took Chinese studies at Cambridge. In 1968, a year of student protest around the globe, he thought revolutionary China offered a vision of the world’s future. He decided to tackle a most difficult language at a time when there was little likelihood of his ever being permitted to visit China. Later still, he learned the harsh truth about life there. He arrived in 1975 to study language at Beijing and, later, literature in Shanghai. 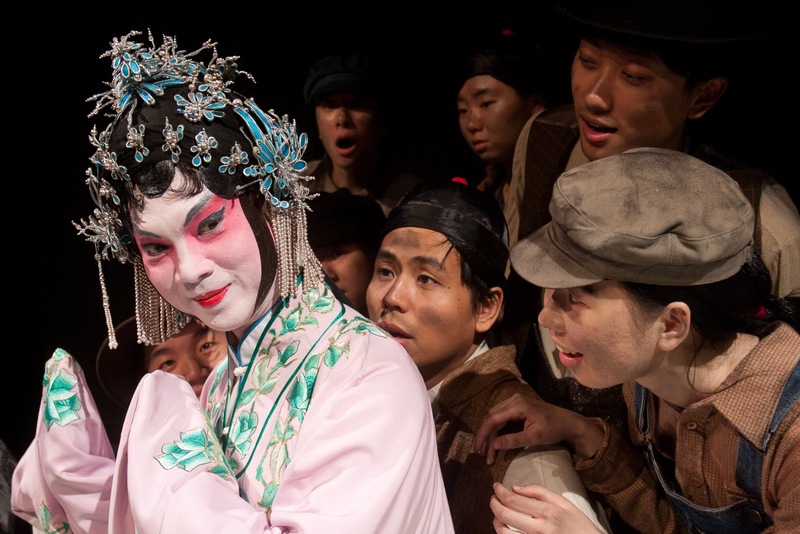 He spent time in a village and a factory. One of 14 foreign students at Fudan University, he shared rooms with Chinese classmates who, he later learned, were obliged to spy on him. There were few pleasures available. “One of the things that there was for us to buy were these beautiful, colourful, dramatic posters,” he said. Over two years of study, he bought about 150 of the posters, many for as little as 20 fen, about four cents each. These were mailed home to Canada. Twenty-five will be on display at the art gallery, alongside posters belonging to Barry Till, the gallery’s curator of Asian Art. 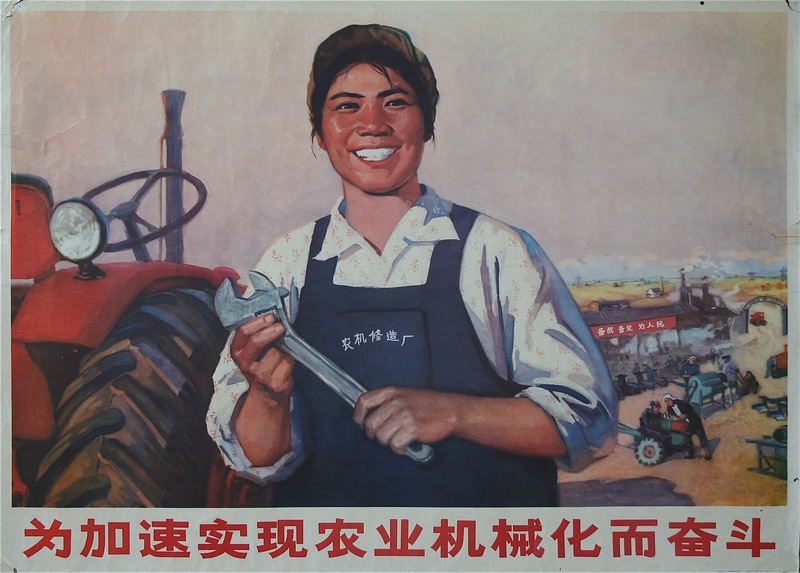 As an image of female empowerment, it is reminiscent of American posters of the Second World War featuring Rosie the Riveter. Other posters express hatefulness towards the “Four Old Evils” (old ideas, old cultures, old customs, old habits), and include denounciations of British and American imperialism. Political power grows not only from the barrel of a gun, but from the bristly end of a paintbrush. An old car and a cup of tea capture life on Oak Bay Avenue. The Tweed Curtain runs along Foul Bay Road, a dividing line of myth and imagination separating ordinary Victoria from the enclave of Oak Bay. Behind the Tweed Curtain can be found a last bastion of the British empire, where high tea is enjoyed on a High Street. In the three-block long stretch of shops known as the Oak Bay Village, a Union Jack flutters above the Blethering Place Tea Room. The restaurant is a few steps from the Penny Farthing pub and the Tudor Sweet Shoppe, the spelling a bit twee even for a purveyor of fine comestibles of the chocolate variety. The shopping district offers antiques and art galleries, bakeries and bookstores, a toy store and a crafts shop. Every summer, along this stretch, a parade of antique vehicles and marching bands trundles past in the annual Oak Bay Tea Party Parade. The parade is led by a man dressed as the Mad Hatter. This Tea Party celebrates a favoured beverage, not a political tendency. The local MLA, Ida Chong, has paraded in an open convertible, helpers distributing candies to the delighted children who line the route. For 14 years, she has represented a waterfront constituency at the extreme southeastern tip of Vancouver Island. The double-barreled name of Oak Bay-Gordon Head evokes comfort and perhaps even privilege. The 38,415 voters share the riding with two private golf clubs, the city’s most prestigious private schools, and the Royal Victoria Yacht Club. It is also home to two hospitals and the leafy campuses of Camosun College and the University of Victoria. What does geography professor Larry McCann, born 65 years ago in Oak Bay and now a resident of the riding’s Cordova Bay neighborhood, think of the Tweed Curtain designation? At first glance, the riding does not seem promising ground in which to plant a political insurgency. As is familiar to letter carriers and newspaper deliverers, simply canvassing some of the wealthy neighbourhoods — such as Ten Mile Point, or the the Uplands, designed by the son of the man responsible for plotting New York’s Central Park — can be daunting, as mansions sit on lots as large as 0.8 hectares. Yet, the corporation of the district of Oak Bay also offers modest bungalows in a section just across the Tweed Curtain known as The Poets, where the streets are named Byron, Milton and Chaucer. The riding’s Gordon Head section, which is part of the district of Saanich, is the more populous part of the riding. It is more suburban in design and also more ethnic, including a notable population of Chinese-Canadians and Indo-Canadians. A snapshot of the riding provided by BC Stats shows an older, better educated, and wealthier population than the provincial average. One voter in five is a senior, while the average household income in 2005 of $90,526 was substantially more than the provincial average of $67,675. Many of the residents have a professional background, as the riding is home to civil servants from all three levels of government, as well as clerks and educators. Mr. McCann notes an influx of young families has made the riding more diverse, while a transient student population offers a group of voters perhaps more concerned with issues of social justice. Elizabeth Cull, a small-business owner who represented the riding for the NDP for seven years before losing to Ms. Chong in 1996, describes the voters as active and informed, especially about public policy issues. “I found you could spend an awful lot of time on the doorsteps talking to people about what was happening in the province,” Ms. Cull said. The riding has a history of independence, often bucking the governing party. Dr. Scott Wallace won the seat for the Conservatives in 1969, held it against an NDP landslide and retained the seat after a revamped Social Credit party swept to power in 1975. The former B.C. finance minister is now proprietor of the local Dig This chain of gardening stores. One outlet can be found at the intersection of Oak Bay Avenue and Foul Bay Road, the very entrance to the Tweed Curtain. Hakeem Jinnah is back, my friend. The crime-solving reporter for the Vancouver Tribune returns in a mystery novel featuring a decapitated body, a drug cartel, and a crazed religious sect. He is the creation of Don Hauka, a New Westminster author who recalls an early Jinnah project being rejected because the character lacked verisimilitude. The judgment sent him scrambling for a dictionary. How could they say Jinnah wasn’t a true-to-life character? He was based on a real person. Mr. Hauka got the newspapering bug as a high school student in his birthplace of Gibsons, where he helped produce a weekly paper at Elphinstone Secondary. He also covered sports and school-board meetings for the Coast News, an independent newspaper still produced with hot lead. A short stint at the Williams Lake Tribune was followed by a time at a university student newspaper before he dropped out to take a job at a journal in a Vancouver suburb. It folded, and he got hired by the rival, only to quit when told the three telephones in the office were for the exclusive use of the advertising sales people. Reporters were expected to use the payphone down the street. Being hired as even a temporary reporter at The Province, the No. 2 newspaper in a two-newspaper town, seemed an entree into the big-time world of a big-city newspaper. He was understandably eager to make an impression. He asks if Mr. Hauka is any relation to Helmut Rauca, a Nazi war criminal who hid in Canada after the war. The big news that day was the discovery in South America of the remains of Dr. Josef Mengele, the infamous Angel of Death of a Nazi concentration camp. “That’s a Mr. Joseph Mengay who lives on West 41st,” Mr. Hauka replied. That was Mr. Hauka’s introduction to Salim Jiwa, a Tanzanian-born reporter with whom he would soon after co-author a book on the Air-India bombing. An updated edition was released four years ago. Both the author and his inspiration have since left the newspaper. Mr. Hauka is a communications consultant, while Mr. Jiwa edits and publishes the Vancouverite online news website. The resourceful reporter debuted in Mr. Jinnah: Securities, a novel about the mysterious death of a shady stock promoter. A made-for-TV movie — Jinnah on Crime: Pizza 101 — aired on the CBC eight years ago. Set in such familiar landscapes as the downtown eastside, the Punjab Market on Main Street, and the confusing sameness of suburban Surrey, the mystery is tackled in exciting fashion by a character whom many might at first find off-putting, or offensive. The Victoria Seals entertained fans for two seasons before abandoning the city. BELOW: Seamore the Seal was loved by children and adults alike. Photographs by Deddeda Stemler. Fans at Royal Athletic Park greeted every plate appearance of popular catcher Josh Arhart with a piratical cry of Arrrrrrr-hart! Up by a few runs, or down by many (the latter unfortunately the more common scenario), the hearty salute to the slugging matey never failed to bring a chuckle. 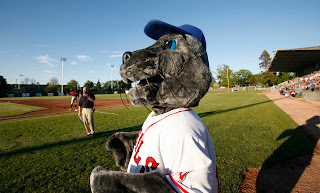 In two summers at the park, through blustery afternoons and seasonably cool evenings, a small but dedicated corps of rooters cheered on the sometimes madcap adventures of the Victoria Seals baseball team. Customers at the sad old park witnessed some odd events. In the final game of the season, Charlie Strandlund, the only Victoria-born athlete on the squad, played all nine positions — pitcher, catcher, four infield and three outfield. Eri Yoshida, an 18-year-old schoolgirl from Japan known as the Knuckleball Princess, pitched a game for a visiting team, striking out Victoria’s leadoff batter to the roars of the largest crowd in franchise history. That same crowd endured unconscionably long beer lines. The ball park crew were unable to serve thirsty patrons whose queue stretched longer than the 90 feet that separates the bases. At the end of each home game, one of the Seals players remained on the field to tidy up, repairing the pitching mound and removing the bases. During one tense game, a Seals batter prepared to face a pitch before jumping dramatically away from the plate. The catcher spun around and the umpire retreated — a sprinkler had begun spraying the home-plate area. It took several minutes before the geyser could be turned off. Then, the players tried to fill in a puddle on the field. Welcome to the minor leagues, son. You learn to hit the curve ball and get an introduction to groundskeeping. After two seasons, the club made a dramatic announcement last week. Darren and Russ Parker, the father-son combination who owned and operated the Seals, announced the franchise had ceased operations. The Seals had been clubbed. The Parkers blamed bureaucrats for not granting concessions in the lease for the city-owned park. They blamed the independent league in which they played for being too far-flung, making necessary expensive airplane flights to Hawaii and such exotic continental locales as Yuma, Ariz., and St. George, Utah. They blamed unionized workers for ... well, for having persnickety rules and for being too well paid. Some of the complaints were disingenuous, as circumstances at Royal Athletic Park — a ground whose name is far more grand than the reality — are as they were when the Parkers came to town. They knew what they were getting into. John Meldrum is a fan who followed the team by box office as well as by box score. An assistant professor at the University of Victoria, he has expertise in sport management and marketing. The independent Golden Baseball League, a six-year-old circuit, has yet to announce the demise of the Seals on its website. But wait. Upon further review, Ballpark Digest magazine is reporting three struggling independent leagues are in talks to merge. 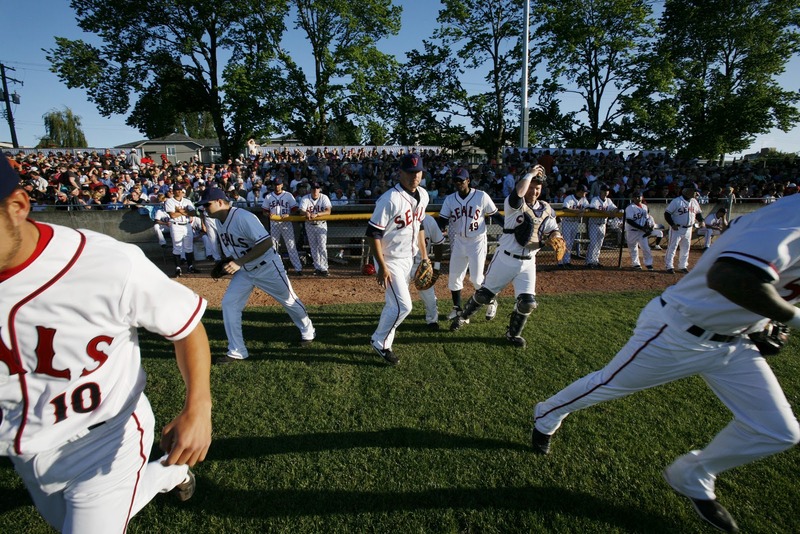 The economy has hammered minor-league baseball, but one drawback of an amalgamation will be even farther travel. Meanwhile, the demise of the Seals puts out of work one of the finest mascots in the land. Seamore the Seal delighted children, amused adults, and otherwise brought a Looney Tunes mentality to the art of cheerleading. Alex Pomerant, who worked more than 80 home games inside the overheated costume, taking breaks on hot days inside a walk-in beer cooler, will now complete his studies in law. He wrote a gracious letter to his employer. “I thanked them for letting me live out the dream I never knew I had,” he said. Anthropomorphic pinniped, good with children, able to boogie to Village People’s YMCA despite oversized flippers, seeks part-time work with sports team, or perhaps sealant company. Will work for peanuts and Cracker Jack, but prefer fish. A basket of poppies was available for students attending Remembrance Day services at Victoria High School this week. She remembers waving goodbye from the station platform, bidding adieu to a husband off to war. Only later, after receiving the worst possible news, would that poignant moment at the train station become frozen in memory as the last time she ever saw her husband. Patricia Hedley is 97 now, a widow a second time, busy this week with packing up her condominium before moving into a care facility, acknowledging at last her own frailties. It is Remembrance Day again and a man now dead more than six decades is still mourned by a woman who remembers their first meeting and their final parting. It has fallen to her to keep alive the memory of Frank Constant Hall, a young lawyer who became a warrior to protect his homeland and the rule of law. Most of her own remembrance is personal and privately conducted. Her great contribution to her first husband’s legacy came in the simple act of noticing his name had been mistakenly excluded on a war memorial at his alma mater. She was born Patricia Porter to a farmer near the Saskatchewan village of Strongfield. The family moved to Victoria, where, as a young woman, she was introduced to the handsome son of a judge. They married in 1937. He practiced law in Vancouver. With the outbreak of war, he decided to enlist. Instead, he joined the Seaforth Highlanders of Canada. Soon after their farewell at the train station, she began receiving correspondence. “He wrote a great many wonderful letters,” she said. “Darling: If my handwriting in this letter is worse than usual, it is because of the throbbing of the ship’s engines and not my nerves,” Mr. Hall wrote. It was July 3, 1943. He was aboard ship days before the invasion of Sicily, a fact he did not include. He wrote of his love for her and about his fond memories of their time together. He quoted the poet Thomas Macaulay. He discussed the possibility of his dying. “Please don’t wear the widow’s weeds too long, if I go West,” he wrote. A month later, a government telegram arrived at his mother’s home in Victoria. On a ridge in Sicily, the gritty Seaforths attacked an enemy position. Lt. Hall fell, gravely wounded. When his men stopped to treat him, he ordered them to continue the attack. After the enemy fled, the soldiers returned to find their officer had bled to death. His widow became a home sister with the Royal Canadian Army Medical Corps, creating a homelike atmosphere in the nurses’ mess. She remarried after the war, becoming a copywriter for radio station CJVI in Victoria. She became a homemaker with the birth of a son and daughter. Some years ago, she attended a reunion at Victoria High School, which maintains memorials for each of the two world wars in the foyer of the main entrance. The First World War memorial is an ornate bas relief, the names of the dead appearing on a shield. The names are listed in alphabetical order from Joseph H. Addison to Richard Wright. She scanned the names, failing to see that of her first husband. She checked again. She told the organizers of the school’s alumni association. A small plaque was later placed on the same pillar. It includes the names of three fallen students missed in the original accounting, among them a judge’s son. Mr. Hall’s story appears briefly in popular military histories, the account of his death coming from Mark Zuehlke’s Operation Husky, the poignant letter to his wife reproduced in No Price Too High by Terry Copp. The passing years left it to a widow to note his absence on a school plaque. Even after she’s gone, she has ensured future classes at Vic High will read her late husband’s name and perhaps wonder who he had been and what he had done. She would like them to know a Vic High grad buried in the parched soil of far-off Sicily has never been forgotten. 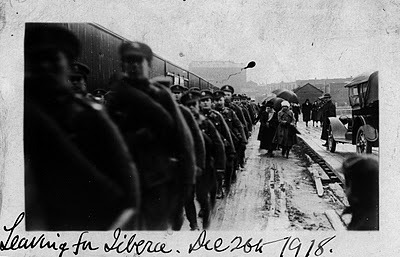 Canadian soldiers march at Rithet's Wharf to board SS Protesilaus before embarking to Siberia. 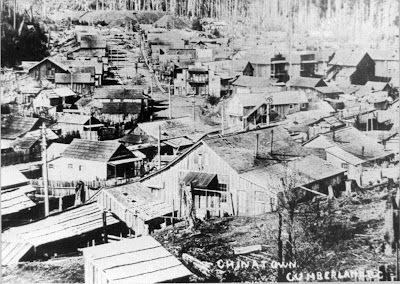 Photograph from British Columbia Archives, I-78248, HP018921. The troops marched from the exhibition grounds to the Victoria docks, a six-kilometre parade during which they rested briefly at a downtown intersection. The command to resume marching was disobeyed. What happened next was hushed up by order of the Dominion censor, becoming a suppressed incident in a mostly ignored chapter of Canada’s military history. It was Dec. 21, 1918, a cold morning in the port city. The Armistice halting the carnage of what was then known as the Great War had been signed only five weeks earlier. Europe was in tumult as dynasties collapsed. The streets were filled with talk of revolution, even as far away as Vancouver Island. The soldiers billeted at Willows Camp in Oak Bay were mostly conscripts from Eastern Canada. They were to be sent overseas to fight not the Hun, but the Bolsheviki. Civil war raged in Russia. Canada joined the Allied nations in a fight to replace the Red soviets with a government more favourable to Western interests. The story of 4,200 Canadian soldiers sailing from British Columbia to the Russian Far East is told in From Victoria to Vladivostok (UBC Press), a fascinating account by the historian Benjamin Isitt. 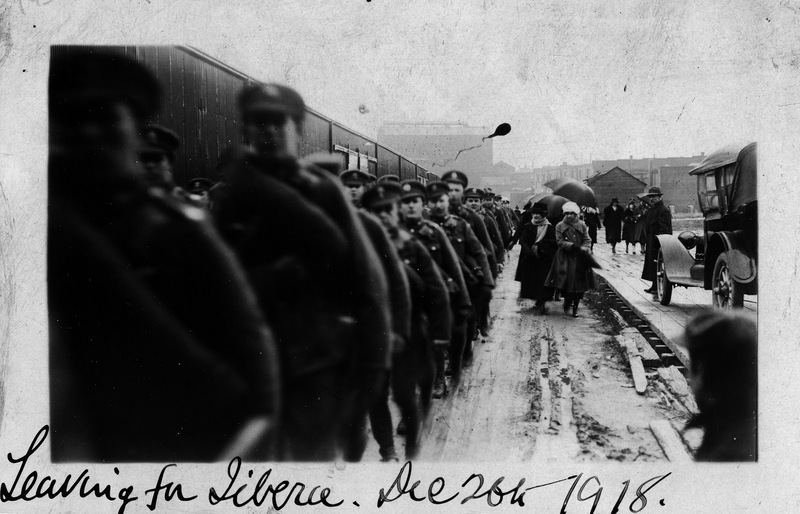 Earlier this week, the University of Victoria launched an extensive, trilingual online archive about the Canadian Expeditionary Force (Siberia). War offers savagery and heroism, carnage and healing, valour and horror. It also offers waste and stupidity and endless, mindless, pointless drudgery. The latter was the fate of the Siberian Expedition. Some of the men saw more action on the streets of Victoria than on the plains of Russia. On that chill morning, a handful of soldiers — farmers, labourers and lumberjacks from Quebec — urged their comrades to disobey orders. A chaotic scene unfolded at the intersection of Fort and Quadra streets. Onil Boisvert, 22, a farmer from Drummondville, repeatedly insisted, “On y vas pas,” according to testimony presented at his later court martial. An officer fired a pistol at his feet. Officers ordered obedient soldiers to whip some of the dissenters with belts. Others were marched to the docks at bayonet point. The mutiny was quickly suppressed, a dozen accused ringleaders shackled together in the hold of SS Teesta for the long journey across the Pacific. Labour and socialist groups agitated against the intervention in revolutionary Russia, finding support among soldiers not eager to go to war. 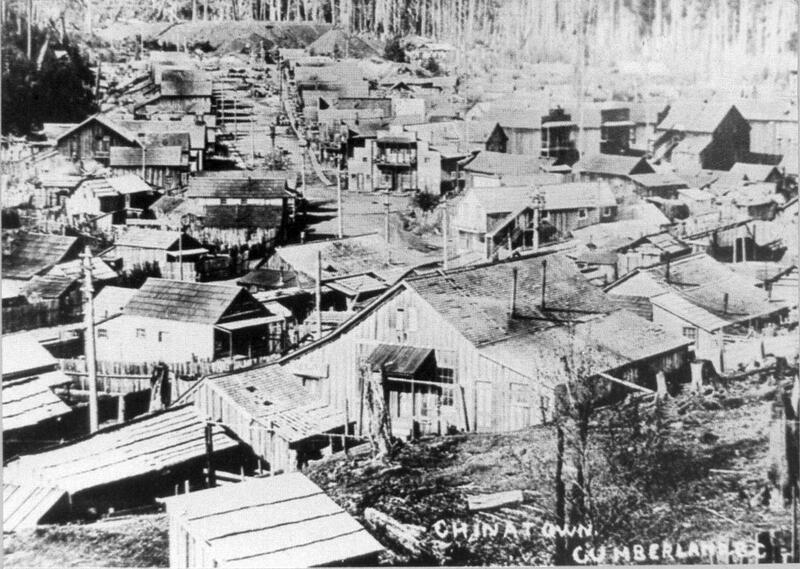 (In an editorial, the Globe acknowledged a large majority of the expedition’s soldiers “went unwillingly,” agreeing with them that the fight was one in which Canada “had no real interest.”) The Willows Camp became a place of rumour and intrigue, as radical newspapers circulated among the soldiers. Those of Russian ethnicity were especially suspect. With another sailing imminent, a handful of officers disrupted a raucous “Hands Off Russia” rally at a downtown theatre attended by hundreds of soldiers. One of the speakers was James Hawthornthwaite, a Labour member of the Legislature. The departure of SS Protesilaus was delayed until after a lavish Christmas dinner and boozy dance was held for the soldiers. The Canadians in Vladivostok saw little action. Among the mutineers, Mr. Roy got the harshest sentence — three years of penal servitude (later commuted to two years). Mr. Laplante got two years hard labour. At an event at the University of Victoria library on Monday, the great distance from that era to today was bridged by the presence of four relatives of men who marched through the streets of Victoria to battle the Bolsheviki. The book by Mr. Isitt (pronounced EYE-sit), a 32-year-old assistant professor at the University of British Columbia, is likely to be controversial among military historians, since he approaches the subject from a labour history perspective. The notes and bibliography run 89 pages. Born in Winnipeg and raised in Victoria, Mr. Isitt became a familiar figure here at Camp Campbell, a protest by activists who set up a tent city on the lawns of the Legislature in opposition to the policies of Premier Gordon Campbell. Mr. Isitt twice ran for mayor of the city, garnering 43.6 per cent of the vote five years ago in a surprisingly strong challenge to re-elected incumbent Alan Lowe. In researching the book, which began as a history term paper and later a masters thesis, Mr. Isitt made a pilgrimage to the Churkin Naval Cemetery at Vladivostok. Among the 14 Canadians buried there are Lt. Alfred Thring, of Saskatoon, Sask., a shell-shocked veteran of the Western Front who committed suicide, and Pte. Edwin Stephenson, who had enlisted with the Canadian Army Medical Corps the day after his ordination as an Anglican minister before dying in far-off Russia of smallpox at age 33. As a military adventure, it was a bust. The soldiers who sailed from British Columbia as part of the Siberian Expedition never left the Russian coast and never reached Siberia. The online archive can be accessed at siberianexpedition.ca . It includes maps, photographs and lesson plans for middle, secondary and post-secondary teachers. The archive is published in English, French and Russian. 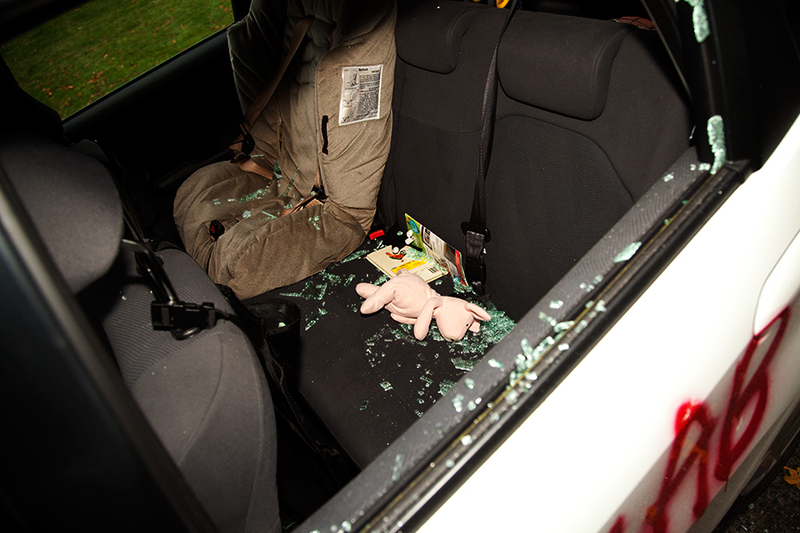 Shattered glass litters the back seat of the mayor's car, covering the safety seat and a stuffed toy. Photograph by the B Channel News. They came under cover of darkness with mischief in mind. They snuck around a modest bungalow on a quiet street. The intruders targeted a home in a middle-class area of Victoria known as Oaklands, where the lawns are tidy and the neighbours friendly. They spray-painted a number on a brown aluminum door. They went to the north side of the house to paint two letters. On the car parked in the driveway, they spray-painted four letters in red. They smashed the right rear passenger window. Glass spilled inside onto a child’s booster seat, showering a small stuffed pink pig. No one heard a thing. As far as is known, they took nothing — other than, briefly, a neighbourhood’s sense of well being. Sleeping inside the home were two young girls and their parents, Donna Sanford and Dean Fortin, the city’s mayor. He had a busy weekend with a fundraising dinner on Saturday night, followed by a coaching session with his nine-year-old daughter’s basketball team on Sunday afternoon. There were leaves to be raked and compost to be spread. The family car had to be taken to the shop and the graffiti had to be painted over. The mayor is called “fatcat Fortin” and another alliterative expletive. He is called a fascist. Here’s a history lesson for homeless-by-choice political activists — attacking a family home under cover of darkness was a tactic favoured by fascist street thugs 70 years ago. Here’s another history lesson. The vandalism occurred on the morning of Guy Fawkes Day, celebrated on these shores by armchair revolutionaries who romanticize a martyred would-be assassin without acknowledging his anti-revolutionary goal it was to bring a Catholic to the throne. The tedious language of the communique echoes the insults to be found in the Front de Liberation du Quebec manifesto read on-air during the October Crisis 40 years ago last month. Is it possible one of the culprits recently watched a documentary on those events? To top it off, the militants conjured a name for themselves as PG 72, which was spray-painted on the Fortin residence. PG stands for Pandora Green, a lawn-covered traffic island downtown on which a recent bylaw restricts overnight sleeping and camping. Seventy-two represents shelter beds recently lost. Even in their numbers the militants are wrong. The loss of temporary spaces is more than made up by a recent increase in permanent accommodations and in the availability of shelter mats under an extreme weather protocol. The mayor will not comment on the language found in the communique. The Victoria police said the language is considered threatening and is being investigated. The communique also includes the mayor’s address. It is not hard to find. He is listed in the telephone directory. The home addresses of the 11 candidates running for a city council seat in a by-election later this month are also included in city advertisements. Victoria remains that kind of place and the mayor vows not to change the practice. “We should be accessible,” he said. His first official act of business in the hours after discovering the vandalism was a two-hour open-door session at city hall in which any citizen can claim 10 minutes of the mayor’s time. The mayor has received calls from MLAs on both sides of the Legislature. City councillors offered him and his family a place to stay this weekend. The local community centre dropped off flowers and a potted plant. As well, one of the neighbours came by and swept up the glass in the driveway. Other attacks on politicians in B.C. In 1977, an activist who said he belonged to a group called the New Questioning Coyote Brigade struck Progressive Conservative leader leader Joe Clark in the face with a coconut-cream pie. The dessert-wielding assailant was Brent Taylor, an activist later convicted for serious acts of sabotage, including the bombing of a factory in Toronto in which missile components were manufactured. Others pied in 1977: provincial cabinet minister Bill Vander Zalm and federal cabinet ministers Ron Basford and Marc Lalonde, those actions claimed by the Groucho Marxist cell of the Anarchist Party of Canada. In 1982, a speech by the federal external affairs minister was cut short after prolonged heckling. Outside, he was surrounded by a small, angry mob. An aide was kicked in the shins and the minister was spat on by a young woman. Mark MacGuigan escaped from the ugly curbside scene when spirited away by car. An angry gauntlet of 500 trade unionists jostled and swore at members of the Social Credit cabinet in 1972 after it imposed a return to work and compulsory arbitration in a construction industry dispute. Chanting “Seig heil!” and targeting Jim Chabot, the labour minister, with the rhyming chant of “Chabot must go!”, the protestors struck Attorney General Leslie Peterson at least twice with placards. In 2002, a crude firebomb was tossed into the high-school office of Nancy Campbell, wife of Premier Gordon Campbell. Earlier in the year, another firebomb had been shoved through the mail slot of his constituency office. The constituency office of NDP Attorney General Ujjal Dosanjh was firebombed in a pre-dawn attack in December, 1999. Sprinklers limited the damage. Before going into politics, Mr. Dosanjh, outspoken in his criticism of Sikh extremists, was beaten nearly to death with a lead pipe outside his law office. 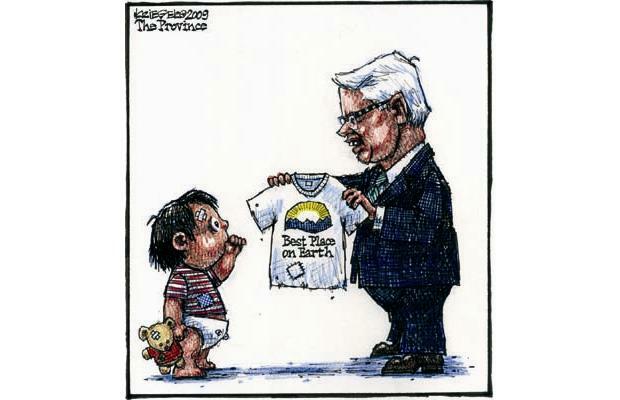 Bob Krieger, the fine cartoonist for the Vancouver Province, owned Gordon Campbell. It was just before Christmas 14 years ago and Gordon Campbell was showing off the family home to a reporter. A few months earlier, he had lost an election he expected to win. “Lots of days you feel like you let down lots of people,” he told me. Many thought he’d not stay as Opposition leader. Instead, he vowed to avenge a defeat he recounted with the anguish of someone who’d been hustled in a game of street craps. He had been mocked for wearing plaid shirts on the campaign trail. He insisted he had a closetful of plaid shirts, adding that if he wore a costume it was the suit and tie he donned for seven years as mayor of Vancouver. The brief house tour was intended to show him off as a successful man, though not a wealthy one. When offered a compliment on a fine home — on a leafy street in the tony Vancouver neighbourhood of Point Grey — he was quick to respond with a tale about a taxi driver who was surprised he did not live in a mansion. No, it was not a mansion. It was not any grander a home than those found in his social circle. But it was still finer than that enjoyed by the vast majority of British Columbians. Mr. Campbell was born to privilege he seems incapable of acknowledging. His grandfather owned a clothing manufacturer’s shop, producing police and firefighter uniforms for the city. As a boy in the 1950s, the family would drive past and little Gordon would see what appeared to be his own name on the sign. Mr. Campbell hailed from an upstanding westside family. His father, a cardiologist, became assistant dean of medicine at the University of British Columbia. Charles Gordon Campbell, known as Chargo, worked hard and drank harder, struggling with depression and alcoholism before dying a suicide from an overdose of prescription pills when Gordon was aged 13. The family’s circumstance changed in dramatic fashion. To his widowed mother’s great credit, Peg Campbell moved her bereaved family into a small apartment and found work. Just last week, in a television address to the province, Mr. Campbell recounted the situation. He attended University Hill Secondary School before heading off to the Ivy League (Dartmouth College), after which he and his bride, the former Nancy Chipperfield, volunteered to teach for two years in Nigeria. He returned to Vancouver and a steady rise thanks to political and business connections. He was ambitious and worked hard. The frustrating 1996 defeat was followed by three majority victories, an accomplishment in a province where politics is played as a blood sport. On election night in May, 2009, a reporter asked what message could be taken by his win. Alas, there is such a thing. The minimum wage at the end of his first year as premier was $8 an hour. Nine years later, the wage remains unchanged. It is the lowest in the land. When he took office, the province’s child poverty statistics were shameful. Nine years later, they remain so. Following his heart left the premier with a nine per-cent approval rating. It left many others waiting for the promised benefits of a competitive taxation system to trickle down. 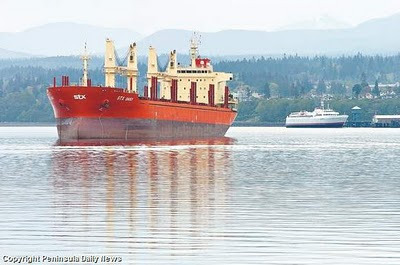 After its skipper was arrested for being drunk, the freighter SFX Daisy rested at anchor off Port Angeles, Wash. The ferry MV Coho, from Victoria, can be seen in the background. Peninsula Daily News photograph. At about 4 a.m., in the inky darkness before sunrise, a U.S. Coast Guard cutter intercepted a freighter in Juan de Fuca Strait. The STX Daisy carried a large load of fuel oil destined for Washington State, where it was to pick up logs for the return voyage to China. About once a week, the Coast Guard conducts unannounced security checks on ships from ports-of-call with security concerns. The inspections are standard procedure, usually lasting about 45 minutes. The Coast Guard officers spent hours aboard ship. They were shocked by what they found. They were also shocked by what they did not find. The captain of the 590-foot, 20,763-gross-ton freighter was radioed in advance by the Coast Guard, who instructed him to have his crew stand on the weather deck rail for counting. He was also told to provide a rope ladder for boarding. Not only did the crew not present, but the Jacob’s ladder provided was both old and rickety. Members of the boarding party wore dry suits and life jackets, as well as bulletproof vests. They carried such equipment as radiation detectors, a handheld computer, and a portable breathalyzer. Nine of the 10 carried sidearms and pepper spray. The boarding team was in a small inflatable boat dispatched from the cutter Sea Lion. Bobbing in one-metre swells, the coxswain of the inflatable timed his approach to the freighter with the rise of the sea, as the Coast Guard officers clambered aboard. The crew was found huddled behind the ship’s superstructure. 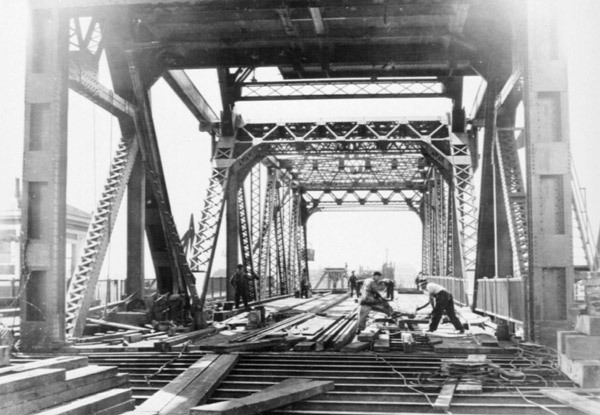 On the bridge, the captain was ordered to provide the ship’s log book and other documents. He left, returning with only some of what was requested. Ordered to get his papers in order, the captain disappeared again. On his return, he spilled the records on the floor of the bridge. The officers smelled alcohol on some of the sailors. They also smelled alcohol on the breath of the captain, who insisted he had a single beer with dinner. Two breathalyzer tests were conducted during which the captain blew 0.102 and 0.108. Both samples were more than twice the legal limit of 0.04. 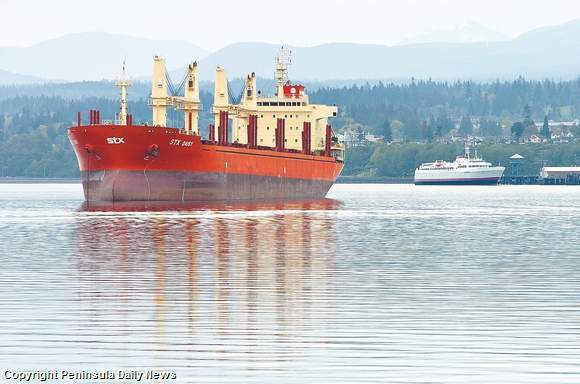 The ship was ordered to anchorage off Port Angeles, Wash., across the strait from Victoria. Later on that day in mid-April, a search of the freighter found an empty bottle of whisky, an empty bottle smelling like chocolate liqueur, and three empty bottles of 40-proof soju, a drink popular in Korea. They also came across 76 empty beer cans. Incredibly, the ship’s garbage record book indicated all empty cans and bottles had been discharged at sea about 12 hours earlier. The crew had quite the party at the coast of North America loomed. The ship’s list of provisions indicated some 38 bottles of soju had been consumed in the fortnight since setting sail. It was also discovered the Daisy had no charts for Puget Sound other than a black-and-white fax that did not show the coloured variations for depth. In the government’s sentencing memorandum, from which this account of the boarding is taken, prosecutors called for a $100,000 fine, as well as a three-month prison sentence as a deterrent to future mariners in these waters. Last week, Judge J. Richard Creatura sentenced the captain to 14 days in prison followed by six months of supervised release. Capt. Seong Ug Sin, a 53-year-old South Korean national, is currently a guest of the U.S. government at the Federal Detention Center — SeaTac, 19.3 kilometres south of Seattle. The facility has paid work assignments. The pay scale ranges from 12 cents to 40 cents an hour, significantly less than the wage earned by the captain of a freighter. Ruth Dewhurst, who has died, aged 84, performed on stage, as well as radio and television, billed as Queen of the Banjo. She was heard by national audiences as a frequent performer on Some of Those Days, a summer variety program aired by CBC Television for six years in the 1960s. The program, hosted by Bill Bellman, featured a Dixieland band fronted by Lance Harrison, for which Dewhurst played banjo. The Dixieland band performed at the Canadian pavilion at Expo 67 in Montreal before embarking on a 13-city Centennial tour of British Columbia. The tour, which began in Penticton and ended in Campbell River 16 days later, featured hour-long concerts that were recorded for later broadcast by CBC Radio. The band again traveled the province the following year as part of a “Jazz on Tour ’68” series of free concerts sponsored and aired by CBC. In 1965, she joined Harrison in recording “The Vancouver Scene,” part of a series of jazz LPs released by RCA Victor. Dewhurst also played the saxophone for the Rhythm Larks, an all-woman band that played dance music on Saturday nights at Pender Auditorium in Vancouver for 15 years. Ruth Arleene Dewhurst was born on Feb. 21, 1926, at Calgary. She died in the Vancouver suburb of Richmond on July 27. She was predeceased by Eddie, her husband of 53 years, who died in 1997. She leaves a son, a daughter, four grandchildren, and two great-grandchildren. In the end, we pay homage as best we can — by donating, by remembering, by learning about the fullness of lives ended in tragic fashion. Tofino, a village whose permanent population is less than 2,000, is preparing for twice as many visitors for a memorial service for two paramedics. 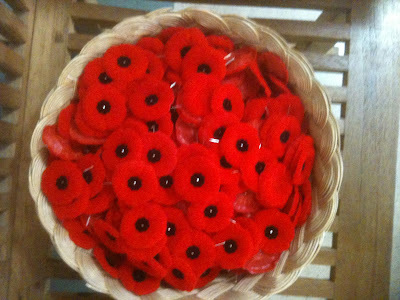 It will be held at 1 p.m. on Saturday at the Wickaninnish Community School. Jo-Ann Fuller, 59, and Ivan Polivka, 65, died when their ambulance careened off Highway 4 before plummeting down a cliff into Kennedy Lake. In so small a place, connections abound. The school is where a bereaved husband has taught elementary students. All the out-of-town mourners driving to Tofino will travel a winding, treacherous road, passing the site of the fatal accident where, at dawn on Oct. 19, the ambulance crashed. For Mr. Polivka’s family, it was a second loss following the death of his wife, Chris Webber, by cancer a year ago. His own tragic death ends a remarkable journey for a man born in the ashes of a world war who later fled his homeland to create a new life on the West Coast. 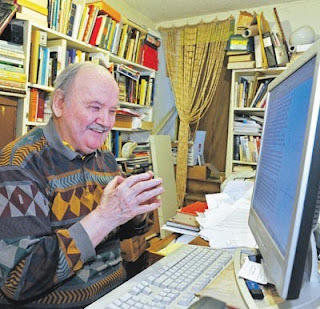 He was a 23-year-old journalist in his native Czechoslovakia when Soviet and Warsaw Pact troops invaded to crush a reform movement that heralded a period remembered as Prague Spring. A critic of hardline Communists, he left, arriving in Canada in November, 1968. He became a busboy and then a waiter, moving up as he mastered his fifth language. He became a citizen, got married, moved to Tofino in 1989, where he became a popular waiter at the original Wickaninnish Inn. With his wife, he hand-built a home on the beach. Those who live in the sleepy village at the end of the road find the setting conducive to exploring one’s creativity. It is also a place where passions are indulged. Mr. Polivka was a poet and diarist, a carver and a hunter, a kayaker and canoeist, a photographer and a watercolourist, a mountain climber and a scuba diver. At home, he baked rye bread and cinnamon buns. But he felt most at home in the wilderness and planned to retire to an isolated cabin on a Yukon lake. A memorial fund to honour the two paramedics has been started by the Justice Institute of B.C., which trains students in justice and public safety. The JIBC Foundation launched the fund with a $10,000 contribution towards a permanent endowment. As well, Lane and John D’Eathe, a Vancouver developer and chair of the foundation’s board, donated another $5,000. Both paramedics graduated from the institute. Ivan Polivka leaves two stepsons, five grandchildren, nine great-grandchildren, and two brothers in the Czech Republic. Jo-Ann Fuller leaves her husband, Brian; three daughters; a grandson; and, a brother. She served with the B.C. Ambulance Service for 23 years and was the unit chief of the station in Tofino. The memorial service at the school is being held four days before what would have been Ms. Fuller’s 60th birthday.